If freelancing interests you but you stuck in a situation where you cannot decide whether you want to commit to Full-time or Part-time freelancing, then you should know what each of them can offer you before you jump in. There are a lot of factors here to the question that can be the deciding factor for you to choose one of them. There are benefits of freelancing part-time as there are benefits of choosing to freelance as your primary source of income. I think for most people, time is a major deciding factor when choosing to work part-time or full-time as these days people value time over everything else. 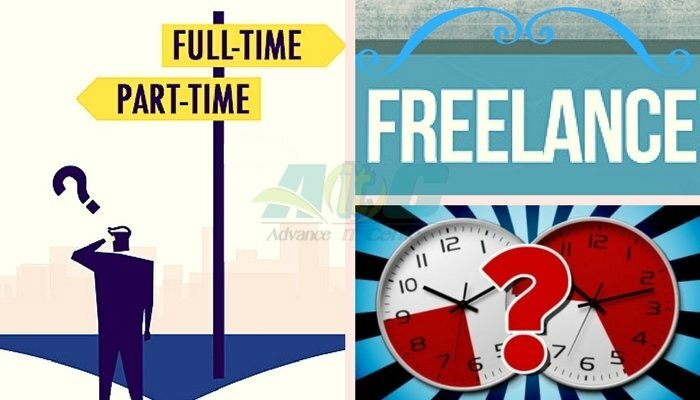 Consider your situation; if you are someone who thrives on the ability to choose your working hours, then you would probably be happy taking on freelancing full-time, whereas if you are okay with the time set for office hours, then you can freelance part-time and also enjoy the benefits of a job. Some other factors when choosing between a part-time and a full-time freelancing career are money (no surprise there), your personality, workplace and many more. While most people would say that money is as important a factor as time, if not more important, I would disagree. If you are passionate about what you do, money will come to you eventually, just be patient. However, it is entirely okay if you do favor time over money, not everyone has the same priorities in life. Besides money, your love for solitude or company is another point to consider as if you want to become a full-time freelancer than chances are, you would be working alone most of the time. Without further ado, let us get right into the world of part-time and full-time freelancing and the positives and negatives each option can offer you. First of all, if you ask any freelancer or anyone was a freelancer before, almost 90% would say that it is better to become a part-time freelancer first before you commit to full-time. This is a wise move because this way you can understand the concept of freelancing first. You may know what freelancing is all about, and you may even have a relative who is a freelancer. But having the knowledge about what freelancers do and experiencing it yourself are two very different things. The reason why part-time freelancing is a right decision for starters is that of how strong the beginning can be. Trust me, it is very rough, and this is the point where many people just give up. Reputation matter a lot in this business and that means when you begin to freelance, no one will be ready to give you a job. You have to earn it. Rep building takes quite a lot of time. But if you start as a part-time freelancer, then you have a primary source of income to cover up your daily expenses, and you can slowly and steadily build your reputation to a level where you can earn good money. So, you do see the point here? If you take freelancing as a full-time gig, then you will be frustrated quite a lot, since you have to start with low-paying jobs. Many successful freelance bloggers and writers once earned only about 1 or 2 dollars per post, whereas now most of them make over $200. So, if you want a full-time freelance career, then you have to have a good deposit of money to back you up, but that is not necessary if you start as a part-timer. If you know you are a good writer, and then you’re starting pay would be around $3 per 1000 words, or if you want to get paid hourly, then it would be approximately $1 or $2 per hour. And this is a meager rate of income if you're going to make a full-time career out of it, but this is a functional building block if you think as a part-timer. The start of your part-time career is all about building a reputation. Earning 3 dollars per hour is not bad if you land content writing jobs and if you love to write then all the better. You are earning money doing what you like; this is huge plus point as most people do not get the opportunity to do so. After you continue to write for a few months and when clients see that you are good at what you do, you can soon ask for $5 per thousand words to even $10 in the first one or two years. Dedicated writers can take this to even $30 per 1000, and if English is your first language (considering you are writing contents in English), then you can earn even more. Income like this makes part-time freelancing a comprehensive side income for students and for people who slowly want to move to full-time freelancing. All you have to do is have to patience to build your reputation. If you do want to freelance part-time, then you have to dedicate to what you do. It is better to have a schedule because you can divide your time among work, friends, family, and freelancing. You do have to work seriously when it is time to freelance; a common mistake that newbies make is that they think freelancing is all about sitting in front a computer and earning money. In fact, freelancing requires you to work more than you would work at an office. When you get clients, do not leave communications gaps during work. Continually update the clients on your progress. Also, regularly check your email and messages to see if they went any words and did not be delay replying to an email and of course, do not leave an unacceptable gap in communication. Be serious about your work and at the same time be friendly, because this way, no one can stop you from getting that perfect 5-star rating. Remember that part-time freelancing is not about earning the massive amount of money, as you either have a primary source of income, or you are a student. So, part-time usually means that you work around 20 to 30 hours per week and not more. Working for this amount of time would require you to take small projects which would earn you less than the long projects that a full-time freelancer can take on. A big issue that you would face when freelancing is competition, clients will only pick you when you are one of the best in the field, nothing less than being one of the best out it is acceptable. Honing your skills is the best way to be excellent at what you do. If you are serious about your career then, always does what you want to offer to your clients, accept low-paying jobs even if it frustrates you in the beginning, and do not give in. You will soon earn a right amount of money in no time. If you want to be your boss and you do not want the hustle and bustle of an office, then full-time freelancing is for you. But before you jump straight right in, first ask yourself if you really can go through all the hardships that you will face once you start your business. By now, you should know that you will not earn big money straight away. That will come once you build your reputation. So, if you are entirely sure that full-time freelancing is what you want to do then consider the following points first as they will help you to lessen your initial frustration a lot. Ask anyone who is a full-time freelancer, and this is what everyone will tell you. Before quitting your job, save some money first! You entirely will not be getting any high paying jobs at the start. So, to go on with your day-to-day life, you need to have enough side money saved to at least cover some expenses for five or six months. First of all, before you quit your job, list down all the expenses that you need to cover for these six months, the list should include from groceries to insurance, rent, entertainment and anything that you need. If possible, skip entertainment since you have to spend a lot of time build up your reputation and you actually will not have time for any pleasure. Since your budget will be tight for the starting months, it is entirely mandatory that you do not waste your hard earned money. Save the maximum you make and then reinvest the money into your business. Use that money to build yourself a website that would work as your portfolio because a portfolio is a must for a full-time freelancer. Resist the temptation to spend unnecessarily, do so by asking yourself if you need the item that is tempting you. If your conscience tells you no, then no! Obviously, there are going to be emergencies for which you require to spend your money, but that is alright. Since freelancing is considered a business and every business needs a strategy to be successful, you should have one too. First of all, keep in mind that money is not the primary factor here. You have that for the deposit that you would continue to the starting months. Ask your clients to give you a 5-star rating on each job that you complete. You have to earn your 5-stars though, that means that any job that you do has to go through careful planning and dedication. If you do each of them with your heart in them, then your clients will be bound to give you that tasty 5-stars. Since you need to pitch for jobs, in the beginning, you need to negotiate better than all the other freelancers who would be competing for that one job. People who usually get the job, in the end, are the ones who are the most confident among all the rest. You need to confidently tell your clients what you can offer that the rest of the crowd cannot. You need to stand for yourself when you discuss payment. Do not be afraid to ask higher amount if you see that it is possible. Most clients would be impressed by the way you handle yourself. Also, raise your rate as you grow as a freelancer, otherwise you will be stuck with low-paying jobs forever. It is you who must decide what you want to earn; clients will not be the first one tell you that you can raise your pay. Confidence comes from the way you speak and present yourself, but you have to be careful not to mix confidence with arrogance or rudeness. Since freelancing can be a little frustrating, you will always be challenged to be your emotions in check. Still be polite to your clients since they are the ones who are going to give 5-stars and the money. Part-time or Full-time, freelancing is something that you really should have a good look at before you get into it. You have to keep in mind that freelancing requires you to do more hours than you usually would in a full-time job, but do keep in mind that after those long hours of hard work, you will reach a right end if you plan your end goal. It entirely depends upon your situation whether you should freelance part-time or full-time. If you are a student, then part-time freelancing is perfect for day-to-day expenses or if you are a graduate, then gradually getting into full-time freelancing will give you a fruitful end goal. So, choose wisely what you want to get into so that you would not regret it later on. So, in the end, if you think that freelancing is for you then choose which option you would prefer and show enough dedication to impress your clients. Your dream is near; you need only to grasp it.